Elliptical trainers have become increasingly popular, and are seen in many gyms and homes across the country. Athletes use elliptical machines as a way to improve fitness and strength. They are a good alternative to other cardiovascular machines. Essentially, ellipticals are a cross between a treadmill and a stair climber, with the addition of upper-body work with arm levers. They can be customized to different fitness levels, are easy to use and a good way to burn calories. The number of calories burned on an elliptical varies depending on your weight, how long you use the machine and the intensity of your workout. 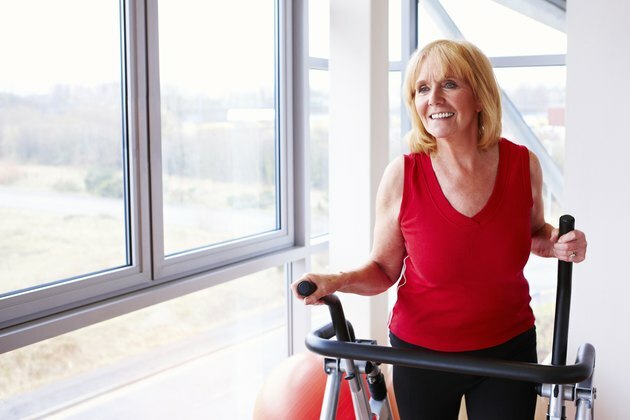 Here are examples of how many calories a person would burn during a moderately challenging workout on an elliptical: A person who weighs 125 pounds would burn 322 calories working out for 30 minutes and 645 calories working out for 60 minutes. A person who weighs 150 pounds would burn 386 calories working out for 30 minutes and 773 in 60 minutes. A person who weighs 175 pounds would burn 451 calories in 30 minutes and 902 in 60 minutes. You can increase the number of calories you burn by increasing the tension on the machine. Most ellipticals come with tension or resistance settings. When you increase this setting, the machine requires more work from you to keep it going at the same rate, so your body is forced to work harder and burns more calories. Adding interval training also burns more calories. Instead of staying at one speed throughout your workout, increase the resistance setting for 30 to 60 seconds, recover at a lower setting for 30 to 60 seconds and repeat this cycle for 10 to 20 minutes. Interval workouts challenge your heart and muscles to work harder for short bursts, which will ultimately burn more calories. As with many exercise machines, an elliptical is only as effective as you make it. Because you choose the settings for duration, speed and resistance, you control how much you benefit. If it is too easy, you will not benefit from the exercise. Choose a setting that will challenge your body, burn more calories and strengthen your cardiovascular and muscular systems as much as possible.